Third time at bat and HERR’s knocks it out of the park again. I am loving this company and their fun and tasty chip flavors. 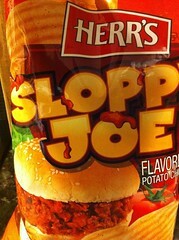 SLOPPY JOE chips? Seriously? HELL YEAH!!!! Okay–that picture is cut off…they aren’t really SLOPP JOE….I cut the damn picture off. It does actually say Sloppy Joe’s on the label. These krinkle-cut chips have a nice crunch and the flavor has all the notes you would expect. It has that meat flavor but it has a tomato kick to it as well. 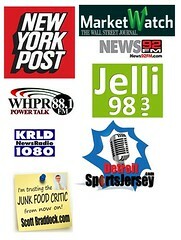 Eating these does give the notion of sloppy joes. Without the mess on my shirt. Found these at Wal-Mart (is that the only place that carries this brand?) and are worth the 3 bucks I paid.